Subscribe to get deals from hundreds of merchants including the best of Paradise Dynasty! Promotion is valid from 26 Feb - 30 Apr 2019.. Payment must be made using a Citibank Credit/Debit Card to enjoy the promotion.. Valid for Citibank Credit and Debit Cardmembers and PGR members.. Valid for dine-in only.. Valid all-day from Mondays to Fridays at other participating outlets.. Not valid at Changi Airport T3 outlet.. Not valid on the eve of/and PH.. Multiple redemptions are allowed.. Not valid in conjunction with other discounts, promotions, vouchers or membership privileges.. While stocks last.. Discount is given on prices before the service charge and 7% GST.. Dishes subject to change.. Citibank's and Paradise Group's decision on all matters relating to the Promotion will be determined at its reasonable discretion and is final and binding on all participants.. Citibank shall not be responsible for the quality, merchantability or the fitness for any purpose or any other aspect of the products and/or services provided by third parties and Citibank shall not at any time be responsible or held liable for any loss, injury, damage or harm suffered by or in connection with the products and/or services provided by third parties. All disputes about quality or performance of the product and/or services shall be resolved directly with Paradise Group.. Citibank and Paradise Group reserve the right, at their reasonable discretion, to vary, add to or delete the Promotion terms and/or terminate the Promotion.. "Citibank" refers to Citibank Singapore Limited. The terms "Paradise Group" and "Paradise Group of Restaurants" refer to Paradise Group Holdings Pte Ltd.. . . Please always check with the merchant on the validity of the promotion before purchase. Valid all-day from Mondays to Fridays at other participating outlets. Not valid at Changi Airport T3 outlet. Not valid on the eve of/and PH. The Promotion period is from 1st January 2018 to 31st December 2019 (both dates inclusive).. Under the promotion, a Citi Debit/Credit Cardmember will receive a SGD10 Paradise Group return voucher with any spend on any Paradise Group of Restaurants, in a single receipt, charged to a Citibank Debit/Credit card.. Voucher is valid for use with a minimum spend of SGD50 on food bill, in a single receipt, charged to a Citibank Debit/Credit card. Minimum spend requirement excludes service charge and GST.. Promotion is valid at the Paradise Group of Restaurants in Singapore, excluding One Paradise. Visit paradisegp.com for full outlet details.. Voucher is not valid from 4 - 19 February and 11 - 12 May 2019.. Voucher is not valid with other offers, promotions, vouchers or membership privileges.. Voucher may only be used on next visit. Original Voucher must be presented when ordering. Duplicates or photocopies are not valid.. Limited to one redemption per table per bill. Splitting of bills is not allowed.. Citibank's and Paradise Group's decision on all matters relating to the Promotion will be determined at its reasonable discretion and is final and binding on all participants.. Citibank shall not be responsible for the quality, merchantability or the fitness for any purpose or any other aspect of the products and/or services provided by third parties and Citibank shall not at any time be responsible or held liable for any loss, injury, damage or harm suffered by or in connection with the products and/or services provided by third parties.. All disputes about quality or performance of the product and/or services shall be resolved directly with Paradise Group.. Citibank and Paradise Group reserve the right, at their reasonable discretion, to vary, add to or delete the Promotion terms and/or terminate the Promotion.. "Citibank" refers to Citibank Singapore Limited. The terms "Paradise Group" and "Paradise Group of Restaurants" refer to Paradise Group Holdings Pte Ltd.. Please always check with the merchant on the validity of the promotion before purchase. Voucher is valid for use with a minimum spend of SGD50 on food bill, in a single receipt, charged to a Citibank Debit/Credit card. Minimum spend requirement excludes service charge and GST. Voucher may only be used on next visit. Original Voucher must be presented when ordering. Duplicates or photocopies are not valid. Citibank shall not be responsible for the quality, merchantability or the fitness for any purpose or any other aspect of the products and/or services provided by third parties and Citibank shall not at any time be responsible or held liable for any loss, injury, damage or harm suffered by or in connection with the products and/or services provided by third parties. All disputes about quality or performance of the product and/or services shall be resolved directly with Paradise Group. Valid from 27 August to 23 September 2018. Collection of mooncakes is available from 13 August to 23 September 2018, at all Paradise Group of restaurants, excluding LeNu.. 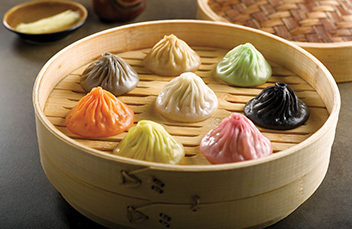 Traditional Teochew Yam Pastry requires advanced order, and is available at Paradise Teochew only.. Discount is valid for Maybank Credit or Debit Cardmembers and PGR Members.. Not valid in conjunction with other discounts, promotions, vouchers or membership privileges.. Discount is given before 7% GST. While stocks last. Management reserves the right to amend terms and conditions of the promotion without prior notice.. Maybank TREATS General Terms and Conditions apply. Please always check with the merchant on the validity of the promotion before purchase.